The judge presiding over the case of Wikileaks' founder Julian Assange's extradition to Sweden has ruled he can be extradited. 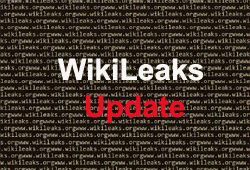 The Judge ruled Assange can get a fair trial in Sweden and that the extradition request and warrant were valid. 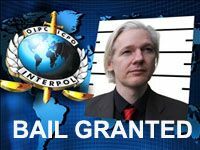 He rejected Assange's claim that he also could be extradited to the U.S. or Guantanamo and said there was no evidence Assange faced torture or extradition if that happened. 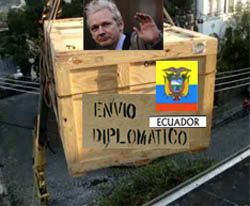 Assange can appeal the decision. This week, the New York Times reported the Justice Department was considering conspiracy charges against Wikileaks founder Julian Assange, rather than espionage charges. If he conspired to get these classified documents with a member of the U.S. Military, that’s fundamentally different than if somebody drops on your lap here.. "Here is-- classified material." Could he have said any more clearly the grand jury is focused on a charge Assange conspired with Manning? Update: The appeals court decided in favor of Julian Assange and he will be released on bail. Update: Julian Assange's statement upon being released from jail. Update: Sweden is appealing the decision. A ruling in the appeal could take a week. Also, Assange's bond is L200,000, which must be in cash because cheques take a week to clear. His lawyer says: "So I have to go around to find cash and have it delivered to court, and until the court has it an innocent man stays in jail." A British Court has granted bail to Wikileak's founder Julian Assange. Via CBS News, Mark Stephens, attorney for Wikileaks' Julian Assange, appears on David Frost's al Jazeera TV show and says they've received word a grand jury has been empaneled in Alexandria, VA to investigate criminal charges. "We have heard from the Swedish authorities there has been a secretly empaneled grand jury in Alexandria...just over the river from Washington DC, next to the Pentagon," Stephens said. "They are currently investigating this, and indeed the Swedes we understand have said that if he comes to Sweden, they will defer their interest in him to the Americans. Now that shows some level of collusion and embarrassment, so it does seem to me what we have here is nothing more than holding charges...so ultimately they can get their mitts on him." Our position of course is that we don't believe it applies to Mr. Assange and that in any event he's entitled to First Amendment protection as publisher of WikiLeaks, and any prosecution under the Espionage Act would in my view be unconstitutional and puts at risk all media organizations in the U.S."
Wikileak's founder Julian Assange is in jail in Great Britain. A judge has denied bond, ruling he is a flight risk, even though he voluntarily appeared at the police station this morning. Five people, including journalist John Pilger, film director Ken Loach and Jemima Khan, the sister of Conservative MP Zac Goldsmith, stood up in court offering to put up sureties. But District Judge Howard Riddle refused bail for Australian Mr Assange and he was remanded in custody until 14 December. Assange will appeal the decision. And his lawyer says Wikileaks will keep on publishing. ""We are on cable 301 and there are 250,000 secret cables."